Sometimes the most amazing experiences are the most coincidental, and the most unplanned. This isn’t perhaps to say that everything should be unplanned – I think that there’s a certain amount of dangerous excitement when the best laid plans come into conflict with the most unpredictable elements of life. And this weekend was certainly no exception. 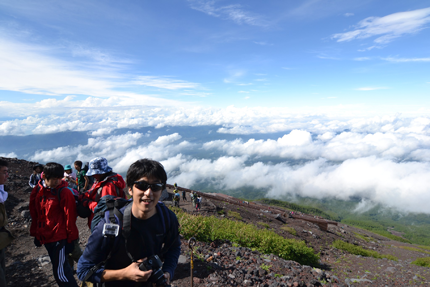 As part of the intern group at Google, we scheduled an offsite trip to Mount Fuji over the weekend. It involved getting to the 5th station of the mountain at midday and climbing to the 8th, where we would take refuge for a couple of hours at a hut before continuing all the way to the top to coincide with sunrise. This last bit is known as “goraikou” in Japanese (the arrival of light) and is a particularly big part of the climbing experience. It wouldn’t be half as exciting if it weren’t for the fact that we almost didn’t go. The weather on Saturday morning in the Fuji-san area was forecasted as rain and thunderstorm, making it potentially too dangerous to climb. Given the logistic nightmare it would have taken to cancel everything and reschedule, we decided our best bet would be to decide what to do at Mount Fuji. Mount Fuji was surprisingly fair weather when we arrived, and so after some last-minute equipment shopping and some much-needed stretches, we headed on our way up at around 1:30pm. Our starting point was the 5th station, at 2300m altitude. The first few stations were relatively uneventful, and while the climb did get slower towards the huts around the 7th~8th stations simply because of the sheer number of people and the narrow paths, we did manage to arrive at the hut around 4 hours later, just in time for dinner. We managed to squeeze in a Google-y Hangout from a phone, sharing a bit of the scenery to one of the interns who couldn’t make it to the trip. The hut we reserved, Toyo-kan, was clean and looked relatively new, and while we were packed like sardines some of us nonetheless managed to get a few hours of sleep. We were now at 3000m altitude. As it got closer to our 11pm departure time we heard the unmistakeable sound of thunder and lightning, which shattered all hopes of reaching the top. With our eyes on radar, the thunder and rain seemed to clear up at around 11:30, at which point we decided to pick up the long walk covered head to toe in rain gear. The rain was not the kind that would immediately drench you, but a more misty and persistant kind that would make you wet before you realized it. With the massive crowd also leaving for the top at around the same time, it was very much a stop and go operation that meant it took us until about 3pm to reach the 8th station. It took another hour and a half to reach the 9th station, at which point we could tell that the surrounding area was getting lighter. We were enveloped in clouds, however, making it a relatively surreal experience. The last 9th-10th station trip took 2 hours, and it was a long and painful 2 hours, especially since we could tell that the top was so near and close. It is perhaps this kind of thinking that is most dangerous, but the climbing pace was so slow it took merely a lot of stubborn will to patiently wait to climb. More than once we felt like wanting to barrel through the crowded line and make it through the several hundred meters needed to get to the top. To complicate matters more, the dedicated descent route was closed due to the fact that it still had snow, making the ascent doubly packed. 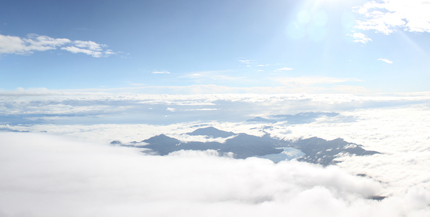 We arrived at the top at 6:13am, just in time to see the cloud and fog part for an undeniably stunning view of the green woods of Yamanashi prefecture and the unmistakeable Kawaguchi lake. After about half an hour of wandering about, seeing the clouds and fog covering the crater, we started the long and unending descent to the bottom. There’s usually a separate descent route from the top, but owing to the weather and the fact that we had started the climb in early July, the route was closed due to snow. This had slowed down the ascent considerably because of the number of folks doubling down the same path. Further down to the 8th station, another descent route allowed us a path to the bottom, though it felt considerably more painful because I really dislike the feeling of losing one’s footing on the steep paths down. After leaving the top at around 7am, we arrived at the bottom about 4 hours later. From there, we headed to an onsen to wash a lot of the grime away, and to take on a powerful sense of tiredness thereafter. This entry was posted on Thursday, July 12th, 2012 at 6:43 am, EST under the category of Articles, Future Me. You can leave a response, or trackback from your own site.